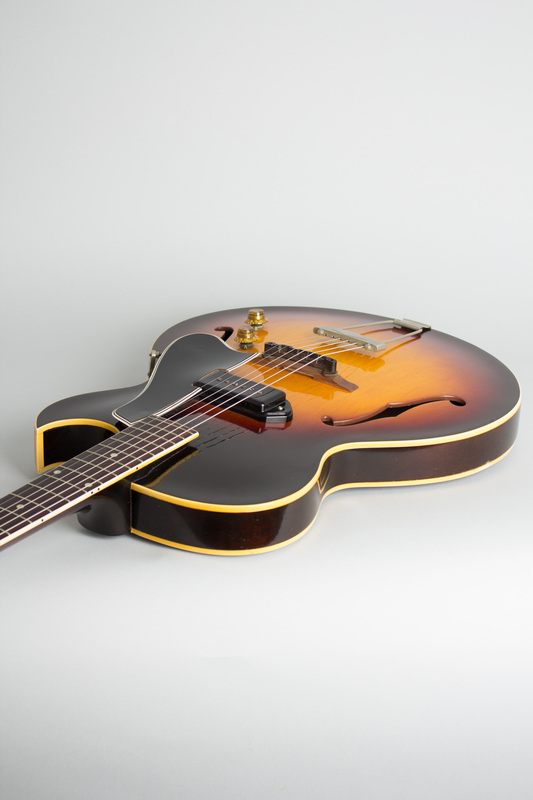 Gibson ES-225 Model Thinline Hollow Body Electric Guitar (1958), made in Kalamazoo, Michigan, serial # T3310-35, sunburst top, dark back and sides finish, laminated maple body, mahogany neck with rosewood fingerboard, black tolex hard shell case. Overall length is 40 1/2 in. (102.9 cm. ), 16 in. (40.6 cm.) wide at lower bout, and 1 15/16 in. (4.9 cm.) in depth, measured at side of rim. Scale length is 24 3/4 in. (629 mm.). Width of nut is 1 11/16 in. (43 mm.). 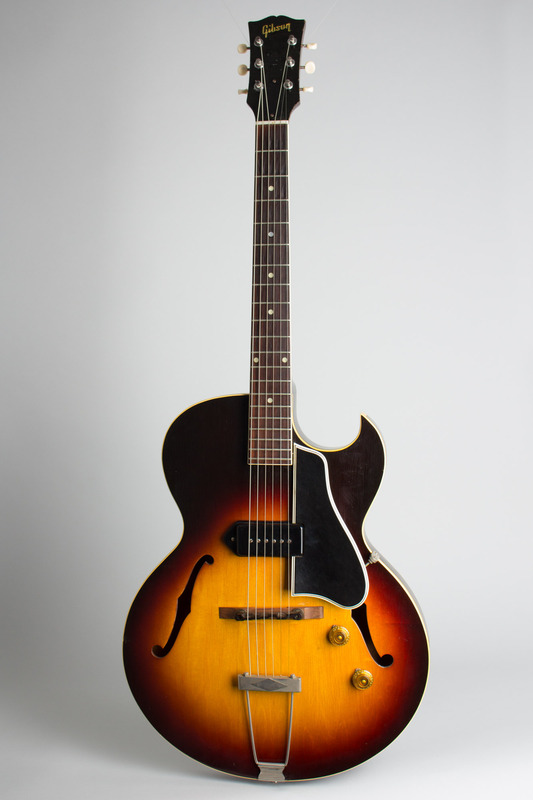 This is a nice player's example of a 1950's ES-225T, Gibson's first budget-grade thinline electric guitar. 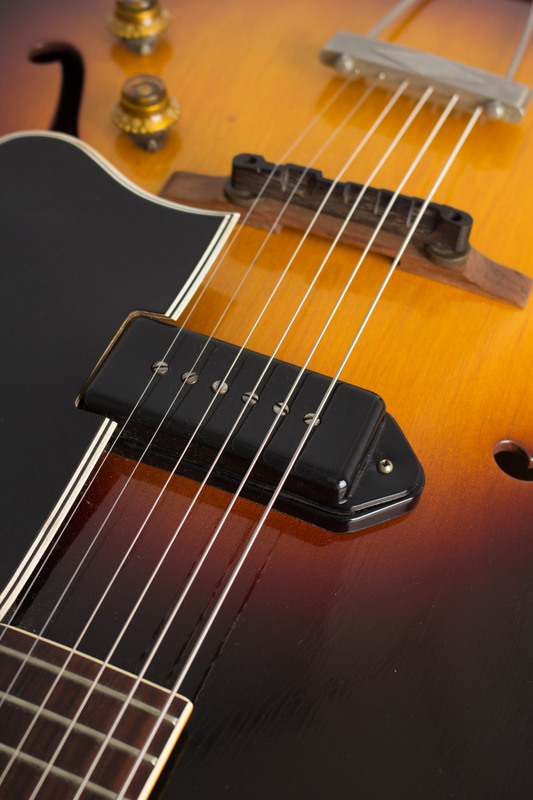 It retains all the original finish and electronics, and the original pickguard is still intact-just the small outer lock nut on the bracket is a newer high quality reproduction. 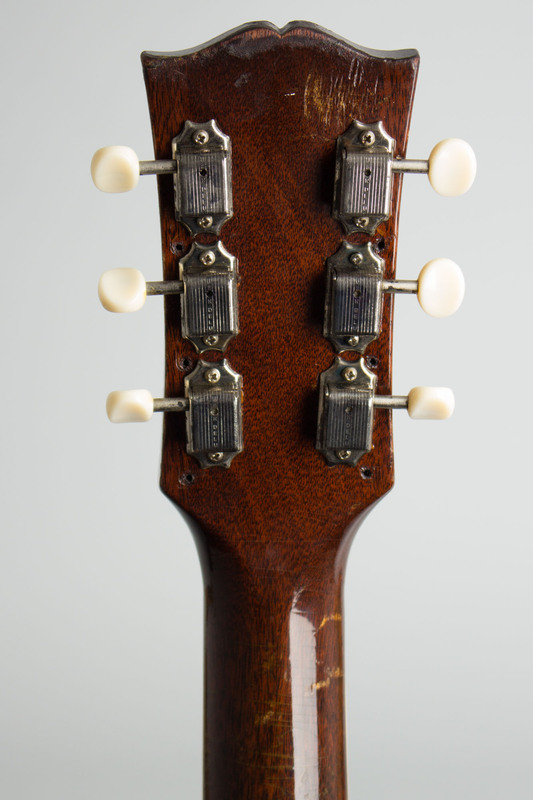 The tuners are correct style repro Klusons; there are marks including screw holes visible from an alternate tuner installation some time back. 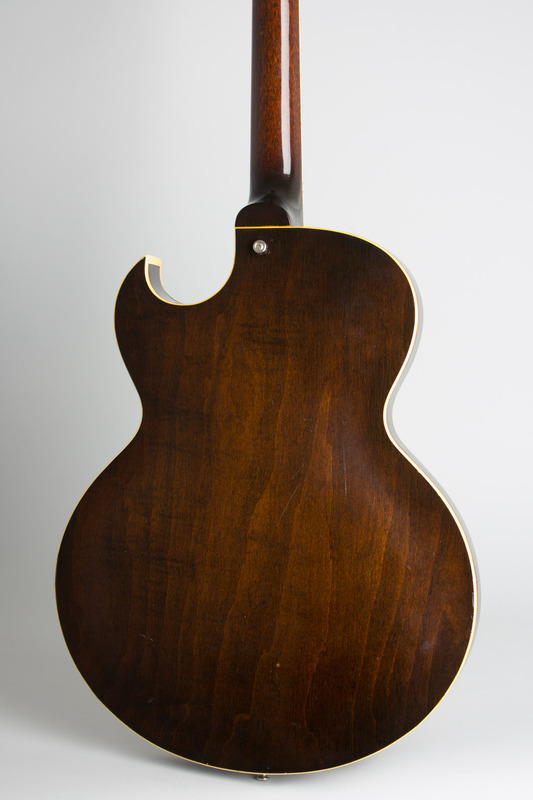 A strap button has been added on the back just below the neck heel. 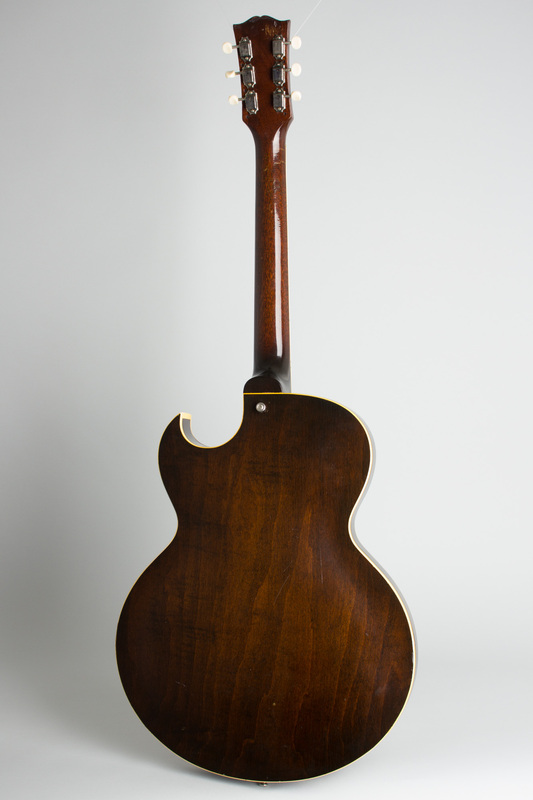 The original Les Paul style bar tailpiece looks to have been converted when the guitar was fairly new to a standard 1950's Gibson wooden bridge/trapeze assembly, which most players seem to prefer. The finish overall shows checking and some minor wear but still has nice vibrant color. 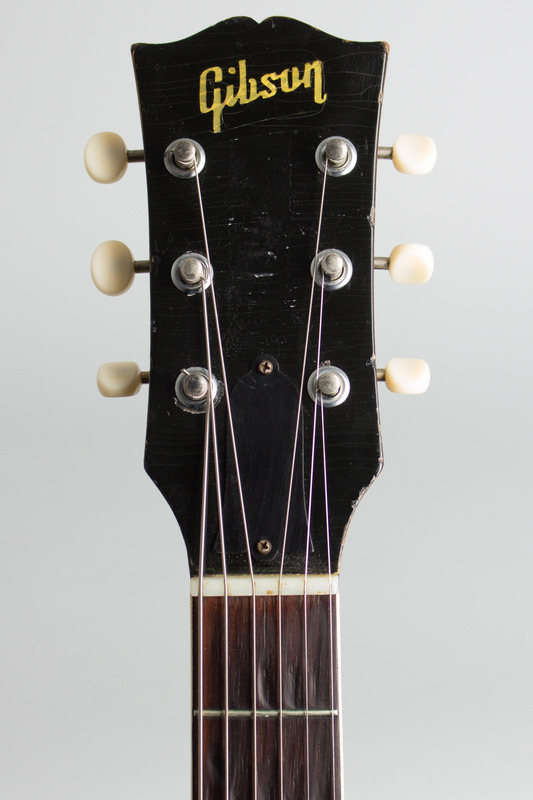 There was once a sticker or somesuch on the headstock face and a mark remains. The fingerboard has some divoting in the lower position, the frets are still in good shape and the guitar plays very well. 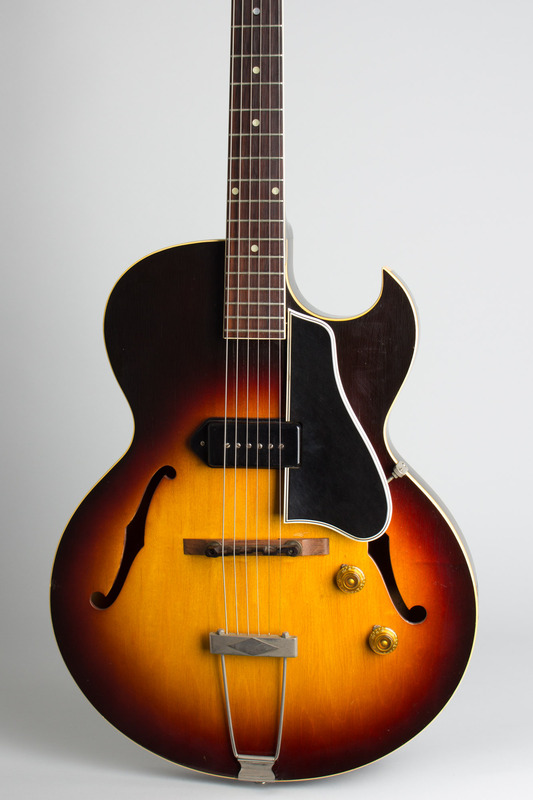 Overall a fine gigging old Gibson, not particularly a versatile model but with a distinctively chunky sound from the single center mounted P-90 pickup. Includes a more recent HSC. Overall Excellent - Condition.